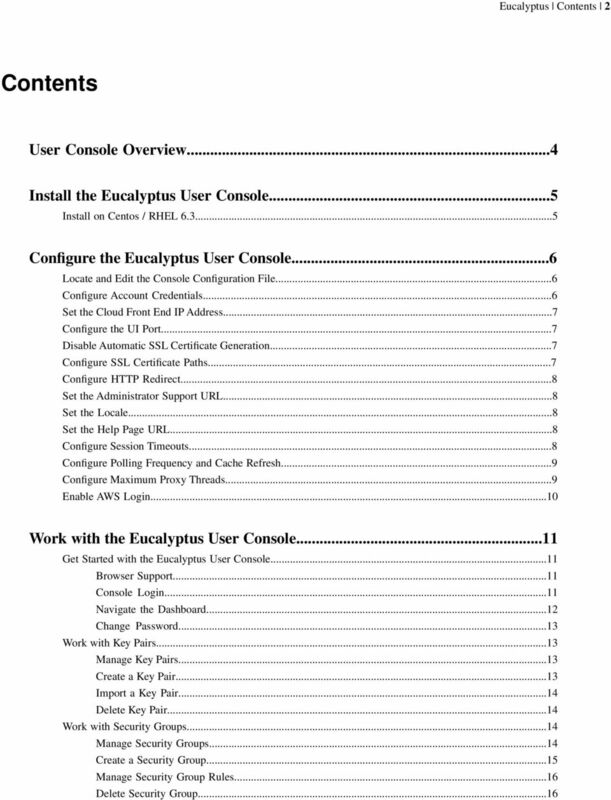 Download "Eucalyptus 3.4.2 User Console Guide"
4 Eucalyptus User Console Overview 4 User Console Overview Welcome to the Eucalyptus User Console Guide. The Eucalyptus User Console is an easy to use web-based interface that allows you to manage your Eucalyptus cloud. You can do many things with the Eucalyptus User Console, including: Get a high-level overview of your cloud with the dashboard Create, manage, and delete instances Create volumes and snapshots Create and import key pairs Create and manage security groups Create and manage Auto Scaling groups Create and manage Elastic Load Balancers Manage your Amazon Web Services cloud Allocate, associate/disassociate, and deallocate IP addresses What's In This Guide This guide contains information on how to install and configure the Eucalyptus User Console, as well as a section on how to navigate and use the screens and dialogs contained in the user console: Section Installing the Eucalyptus User Console Configuring the Eucalyptus User Console Working with the Eucalyptus User Console Description Contains instructions on how to install the Eucalyptus User Console. Describes how to locate and configure the console configuration file, as well as each setting in the configuration file. Discusses how to get started using the Eucalyptus User Console and how to navigate and use the screens and dialog boxes in the console. 5 Eucalyptus Install the Eucalyptus User Console 5 Install the Eucalyptus User Console This section covers how to install the Eucalyptus User Console. Install on Centos / RHEL 6.3 Note: The Eucalyptus User Console package is installed with the Eucalyptus repositories. The following instruction assumes that you're installing the console on a server that's already running Eucalyptus. If you're installing the console on a stand-alone machine, please see the Eucalyptus Installation Guide to set up the Eucalyptus repositories before following the instructions below. Note: The version of the user console you're running should be the same as the version of Eucalyptus you're running. Running a user console against a Eucalyptus installation with a different version is unsupported. Note: The Eucalyptus User Console package will only install on 64-bit architectures. 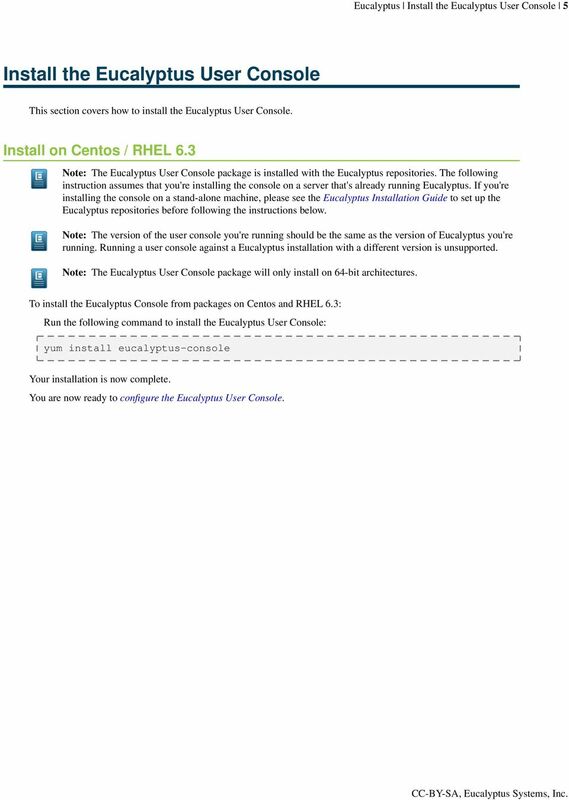 To install the Eucalyptus Console from packages on Centos and RHEL 6.3: Run the following command to install the Eucalyptus User Console: yum install eucalyptus-console Your installation is now complete. 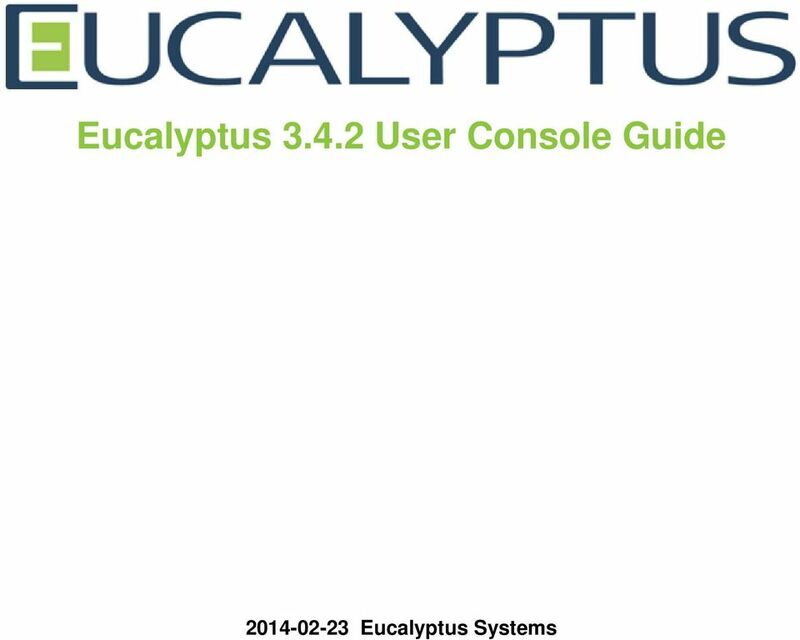 You are now ready to configure the Eucalyptus User Console. 11 Eucalyptus Work with the Eucalyptus User Console 11 Work with the Eucalyptus User Console This section covers how to navigate and use the various screens and dialogs in the Eucalyptus User Console. 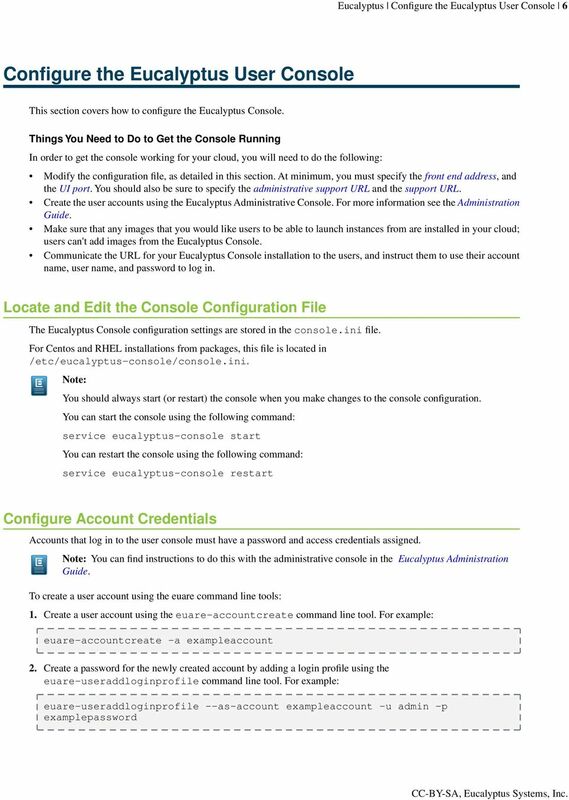 Get Started with the Eucalyptus User Console This section covers how to connect to the console, login, and use the main navigation screen. Browser Support As of this writing, the Eucalyptus User Console has been tested to support the following browsers: Google Chrome 22 Apple Safari 6 Mozilla Firefox versions 15 through 22 Microsoft Internet Explorer versions 9 and 10 Other browsers that are not listed here may work; the list above only represents browsers that have been tested and confirmed to work with the Eucalyptus User Console. Console Login This screen allows you to log in to the Eucalyptus User Console with either your Eucalyptus or your Amazon Web Services account. If you've forgotten your password, don't have login credentials, or do not know the URL for the Eucalyptus User Console for your Eucalyptus account, please contact your system administrator. 1. 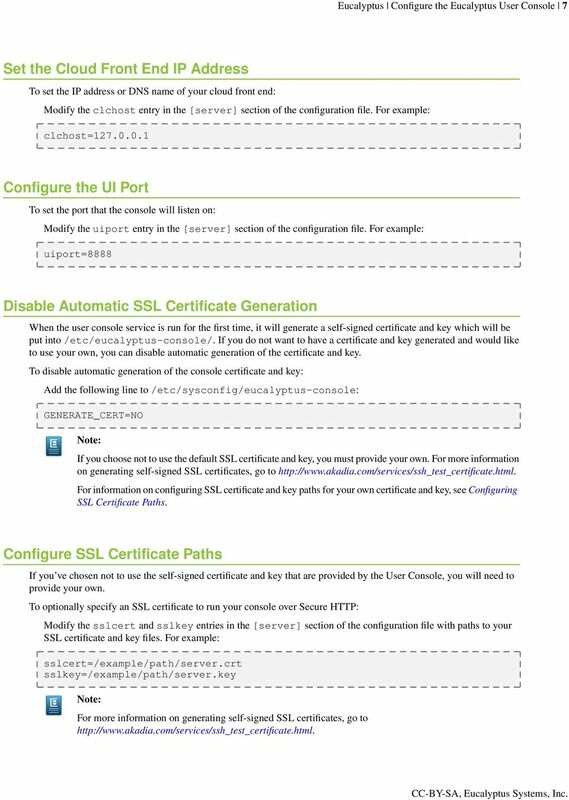 Navigate to the Eucalyptus User Console by typing the URL of the User Console into your browser's navigation bar. The URL of the Eucalyptus User Console depends on how the console was installed in your cloud; see your system administrator for the specific URL for your installation. 2. 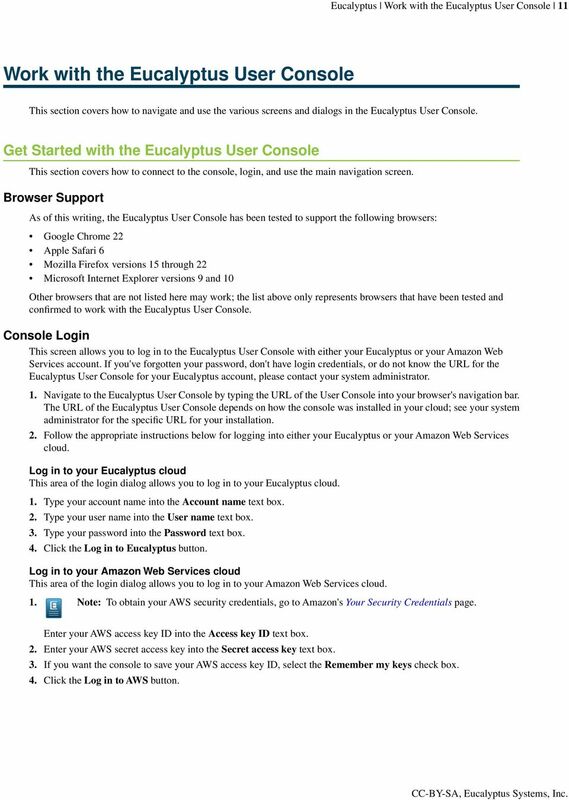 Follow the appropriate instructions below for logging into either your Eucalyptus or your Amazon Web Services cloud. Log in to your Eucalyptus cloud This area of the login dialog allows you to log in to your Eucalyptus cloud. 1. Type your account name into the Account name text box. 2. Type your user name into the User name text box. 3. Type your password into the Password text box. 4. Click the Log in to Eucalyptus button. Log in to your Amazon Web Services cloud This area of the login dialog allows you to log in to your Amazon Web Services cloud. 1. Note: To obtain your AWS security credentials, go to Amazon's Your Security Credentials page. Enter your AWS access key ID into the Access key ID text box. 2. Enter your AWS secret access key into the Secret access key text box. 3. If you want the console to save your AWS access key ID, select the Remember my keys check box. 4. Click the Log in to AWS button. 12 Eucalyptus Work with the Eucalyptus User Console 12 Navigate the Dashboard The dashboard is your starting point for using the Eucalyptus console. From the Dashboard, you can access landing pages for instances, scaling groups, storage items (volumes, and snapshots), and networking and security objects (key pairs, security groups, and IP addresses). Basic Dashboard Navigation You can navigate to specific resource management dialogs in two ways: using the navigation icons at the top of the screen or clicking directly on a resource label or count in the Dashboard screen. 1. You can click on one of the icons at the top of the dashboard to navigate directly to a resource management screen or back to the main console screen. 2. You can also navigate to a resource management screen by clicking directly on a resource label or count in the main dashboard window. Instances The Instances section allows you to see how many instances are running and access the Manage Instances screen. 1. Click the Running or Stopped labels or counts in the Instances section of the dashboard to display the Manage Instances screen. Note: Your initial view in the Manage instances screen will be filtered by running or stopped instances, depending on which label you clicked. To see all running and stopped instances, be sure to change the the value in the search bar at the top of the Manage instances screen. 2. You can filter the instances displayed on the dashboard by availability zone by selecting an availability zone from the drop-down list in the Instances section. 3. You can launch a new instance by clicking the Launch instance link to display the Create new instance screen. Scaling Groups The In Scaling Groups section allows you to see how many instances are running in scaling groups and access the Manage Scaling Groups screen. 1. Click the In Scaling Groups label or count in the Instances section of the dashboard to display the Manage Scaling Groups screen. 2. You can filter the scaling groups displayed on the dashboard by availability zone by selecting an availability zone from the drop-down list in the Instances section. Storage The Storage section allows you to see at a glance how many storage objects are running and access the various storage object management screens. 1. To access the Manage Volumes screen, click the Volumes label or count. 2. To access the Manage Snapshots screen, click the Snapshots label or count. Network and Security The Network and Security section allows you to see at a glance the number of security groups, key pairs, and IP addresses in your Eucalyptus cloud, and to navigate to management screens for each type of object. 1. 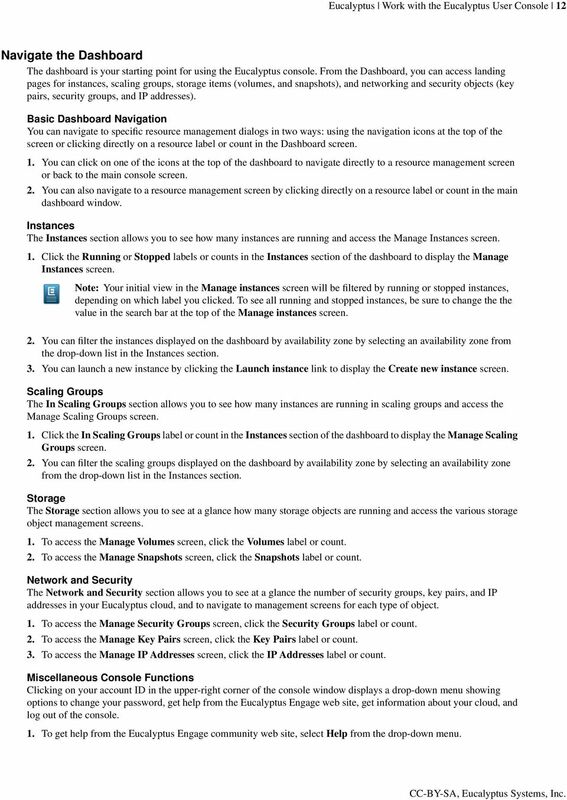 To access the Manage Security Groups screen, click the Security Groups label or count. 2. To access the Manage Key Pairs screen, click the Key Pairs label or count. 3. To access the Manage IP Addresses screen, click the IP Addresses label or count. Miscellaneous Console Functions Clicking on your account ID in the upper-right corner of the console window displays a drop-down menu showing options to change your password, get help from the Eucalyptus Engage web site, get information about your cloud, and log out of the console. 1. To get help from the Eucalyptus Engage community web site, select Help from the drop-down menu. 13 Eucalyptus Work with the Eucalyptus User Console To change your password, select Change password from the drop-down menu. 3. To show a dialog box with information about your cloud, click About your cloud from the drop-down menu. 4. To log out of the Eucalyptus console, select Log out from the drop-down menu. Change Password This dialog box allows you to change your password. Change Your Password 1. Type your current password into the Current password text box. 2. Type your new password into the New password text box. 3. Type your new password into the Confirm password text box to ensure that you've typed the new password correctly. 4. Click the Change password button. Work with Key Pairs This section covers how to navigate and use the key pair screens and dialogs in the Eucalyptus User Console. Manage Key Pairs This screen allows you to view a list of your key pairs, create new key pairs, and delete key pairs. You can page through the list of key pairs by clicking the navigation buttons at the bottom of the screen. Sorting the Key Pair List Click on the Name column header to toggle sorting the list of key pairs in ascending or descending order. Searching the Key Pair List Type some search text into the Search text box to filter the list of key pairs. Creating Key Pairs Click the Create new key pair button. The Create Key Pair dialog box will appear. Importing Key Pairs Click the Import key pair button. The Import key pair dialog box will appear. Deleting Key Pairs 1. Click the checkbox next to the key pair. 2. Click the More actions button at the top of the list and and select Delete from the drop-down menu. The Delete Key Pair dialog box will appear. Create a Key Pair Eucalyptus uses cryptographic key pairs to verify access to instances. Before you can run an instance, you must create a key pair. Creating a key pair generates two keys: a public key (saved within Eucalyptus) and a corresponding private key (output to the user as a character string). To enable this private key you must save it to a file and set appropriate access permissions (using the chmod command), as shown in the example below. When you create a VM instance, the public key is then injected into the VM. Later, when attempting to login to the VM instance using SSH, the public key is checked against your private key to verify access. Note that the private key becomes obsolete when the public key is deleted. 14 Eucalyptus Work with the Eucalyptus User Console 14 Create Key Pairs with the Console 1. From the main dashboard screen, click the Key Pairs link in the Network and Security section, or select the Network and Security submenu from the Manage Resources navigation menu. The Manage Keypairs screen will appear. 2. On the Manage Key Pairs screen, click the Create new key pair link. The Create New Key Pair dialog will appear. 3. Type a name for the new key pair into the Name text box. 4. Click the Create and Download button. The private half of the key pair is saved to the default download location for your browser. Note: Keep your private key file in a safe place. If you lose it, you will be unable to access instances created with the key pair. 5. Change file permissions to enable access to the private key file in the local directory. For example, on a Linux or Mac OS X system: chmod 0600 <keypair_name>.private Import a Key Pair This dialog box allows you import an existing key pair. 1. Enter a name for the key pair in the Name text box. 2. Paste the contents of your SSH key into the SSH key contents text box, or click on the Browse to file link to read the contents of an existing SSH key file. 3. Click the Import button. Delete Key Pair This dialog box allows you to confirm or cancel a key pair delete operation. Verify Key Pair Deletion 1. To verify that you wish to delete the selected key pair(s), click the Yes, delete button. 2. To cancel the delete operation, click the Cancel button. 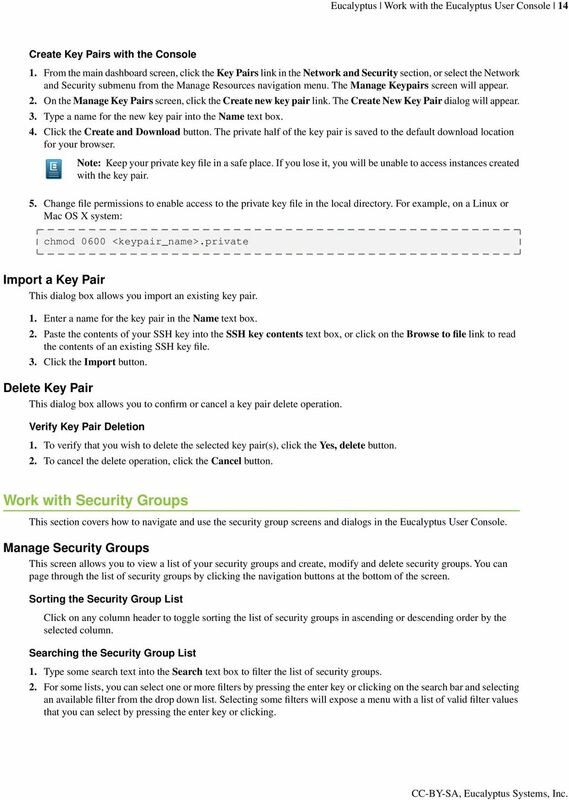 Work with Security Groups This section covers how to navigate and use the security group screens and dialogs in the Eucalyptus User Console. Manage Security Groups This screen allows you to view a list of your security groups and create, modify and delete security groups. You can page through the list of security groups by clicking the navigation buttons at the bottom of the screen. Sorting the Security Group List Click on any column header to toggle sorting the list of security groups in ascending or descending order by the selected column. Searching the Security Group List 1. Type some search text into the Search text box to filter the list of security groups. 2. For some lists, you can select one or more filters by pressing the enter key or clicking on the search bar and selecting an available filter from the drop down list. Selecting some filters will expose a menu with a list of valid filter values that you can select by pressing the enter key or clicking. 16 Eucalyptus Work with the Eucalyptus User Console 16 To add new tags: 1. Type the key name for your tag into the Key text box. 2. Type the value for your tag into the Value text box. 3. If you wish to add additional tags, click the + button to the right of the Value text box. To edit one or more tags: Move your mouse over the tag you wish to edit and click the pencil button to the right of the Value text box. To delete one or more tags: Move your mouse over the tag you wish to delete and click the minus button to the right of the Value text box. To undelete one or more tags: Move your mouse over the tag you wish to undelete and click the X button to the right of the Value text box. Save Your Work Click the Create button to save your work, or click the Cancel button to cancel the operation. 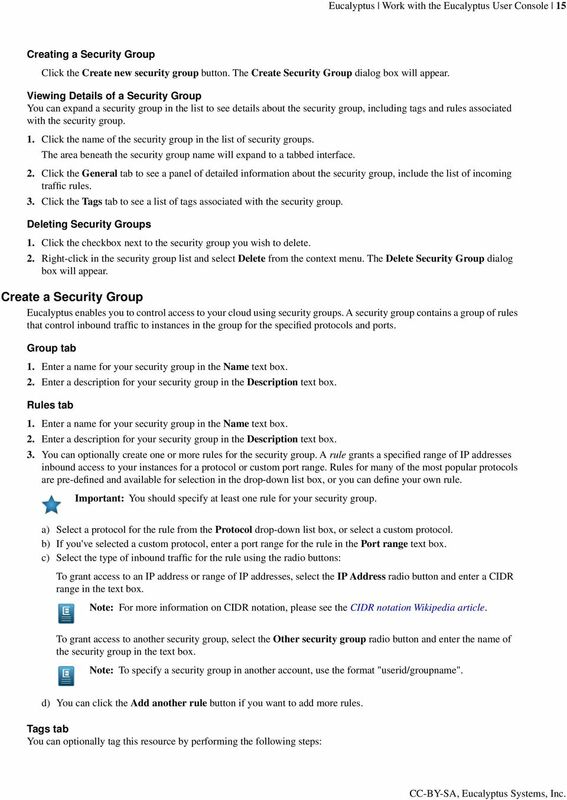 Manage Security Group Rules This dialog allows you to edit the rules for a security group. Add Security Group Rules You can optionally create one or more rules for the security group. A rule grants a specified range of IP addresses inbound access to your instances for a protocol or custom port range. Rules for many of the most popular protocols are pre-defined and available for selection in the drop-down list box, or you can define your own rule. 1. Select a protocol for the rule from the Protocol drop-down list box. 2. Enter a port range for the rule in the Port range text box. 3. Select the type of inbound traffic for the rule using the radio buttons: To grant access to an IP address or range of IP addresses, select the IP Address radio button and enter a CIDR range in the text box. Note: For more information on CIDR notation, please see the CIDR notation Wikipedia article. To grant access to another security group, select the Other security group radio button and enter the name of the security group in the text box. Note: To specify a security group in another account, use the format "userid/groupname". 4. Click the Save Changes button. 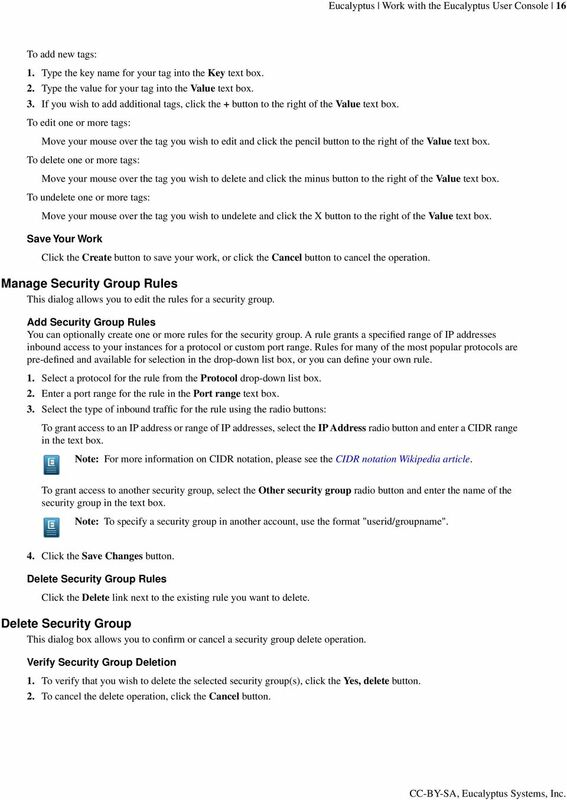 Delete Security Group Rules Click the Delete link next to the existing rule you want to delete. Delete Security Group This dialog box allows you to confirm or cancel a security group delete operation. Verify Security Group Deletion 1. To verify that you wish to delete the selected security group(s), click the Yes, delete button. 2. To cancel the delete operation, click the Cancel button. 17 Eucalyptus Work with the Eucalyptus User Console 17 Work with Volumes This section covers how to navigate and use the volume screens and dialogs in the Eucalyptus User Console. Manage Volumes Eucalyptus offers persistent storage that you can attach to a running instance. These Eucalyptus block storage (EBS) volumes persist autonomously from the running life of an instance. After you attach a block volume to an instance, you can use it like any other physical hard drive. This screen allows you to view a list of your volumes, create new volumes, attach and detach volumes to a running instance, and delete volumes. You can page through the list of volumes by clicking the navigation buttons at the bottom of the screen. Sorting the Volume List Click on any column header to toggle sorting the list of volumes in ascending or descending order by the selected column. Searching the Volume List 1. Type some search text into the Search text box to filter the list of volumes. 2. For some lists, you can select one or more filters by pressing the enter key or clicking on the search bar and selecting an available filter from the drop down list. Selecting some filters will expose a menu with a list of valid filter values that you can select by pressing the enter key or clicking. Creating a Volume Click the Create new volume button. The Create Volume dialog box will appear. Viewing Details of a Volume You can expand a volume entry in the list to see details about the volume, including associated tags and instances. 1. Click the name of the volume in the list of volumes. The area beneath the volume name will expand to a tabbed interface. 2. Click the General tab to see a panel of detailed information about the volume, include the list of instances attached to the volume. 3. Click the Tags tab to see a list of tags associated with the volume. Attach a Volume to a Running Instance 1. Right-click on the unattached volume you wish to attach to a running instance. 2. Select Attach to instance from the context menu. The Attach volume to instance dialog box will appear. Note: You can also click on a volume and click the More actions link at the top of the list. 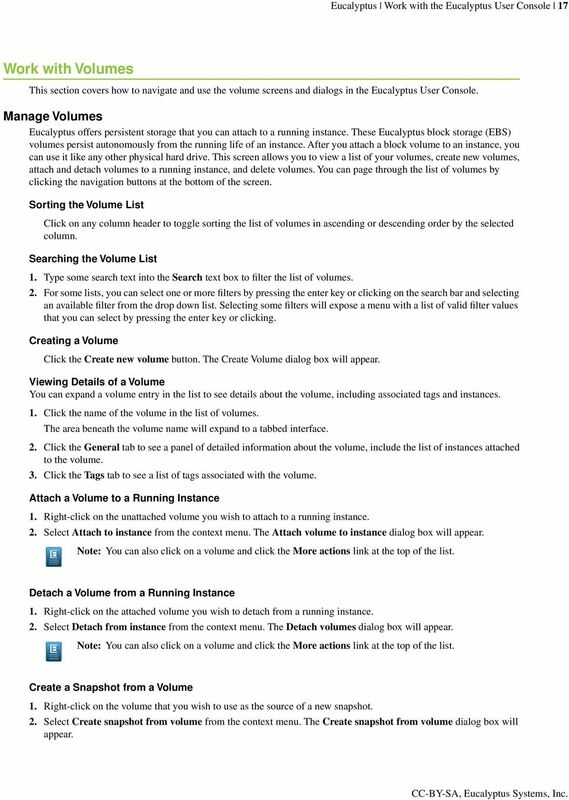 Detach a Volume from a Running Instance 1. Right-click on the attached volume you wish to detach from a running instance. 2. Select Detach from instance from the context menu. The Detach volumes dialog box will appear. Note: You can also click on a volume and click the More actions link at the top of the list. Create a Snapshot from a Volume 1. Right-click on the volume that you wish to use as the source of a new snapshot. 2. Select Create snapshot from volume from the context menu. The Create snapshot from volume dialog box will appear. 18 Eucalyptus Work with the Eucalyptus User Console 18 Deleting Volumes 1. Click the checkbox next to the volume. Note: You can't delete a volume that is attached to an instance. 2. Right-click in the volume list and select Delete from the context menu. The Delete Volume dialog box will appear. Create a Volume Eucalyptus offers persistent storage that you can attach to a running instance. These Eucalyptus block storage (EBS) volumes persist autonomously from the running life of an instance. After you attach a block volume to an instance, you can use it like any other physical hard drive. General tab Add the details of your new volume: 1. Type the name of your volume in the Name text box. 2. If you would like to create a volume from an existing snapshot, select the snapshot from the Create from snapshot? drop-down listbox. 3. Enter the size of the volume in gigabytes in the Volume Size (GB) text box. Note: If you're creating a volume from a snapshot, you can't enter a volume size that's smaller than the original snapshot you've selected. 4. Select an availability zone from the Availability Zone drop-down list box. 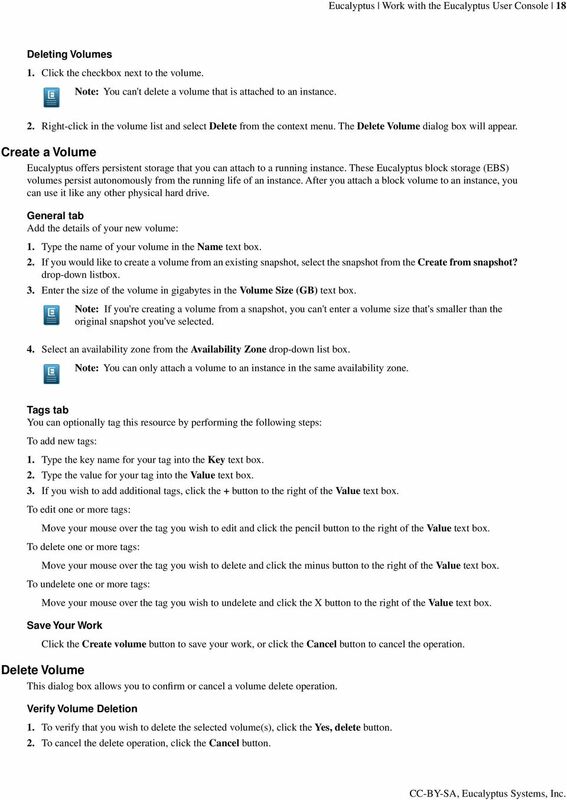 Note: You can only attach a volume to an instance in the same availability zone. Tags tab You can optionally tag this resource by performing the following steps: To add new tags: 1. Type the key name for your tag into the Key text box. 2. Type the value for your tag into the Value text box. 3. If you wish to add additional tags, click the + button to the right of the Value text box. To edit one or more tags: Move your mouse over the tag you wish to edit and click the pencil button to the right of the Value text box. To delete one or more tags: Move your mouse over the tag you wish to delete and click the minus button to the right of the Value text box. To undelete one or more tags: Move your mouse over the tag you wish to undelete and click the X button to the right of the Value text box. Save Your Work Click the Create volume button to save your work, or click the Cancel button to cancel the operation. Delete Volume This dialog box allows you to confirm or cancel a volume delete operation. Verify Volume Deletion 1. To verify that you wish to delete the selected volume(s), click the Yes, delete button. 2. To cancel the delete operation, click the Cancel button. 19 Eucalyptus Work with the Eucalyptus User Console 19 Attach a Volume This dialog box lets you attach an EBS volume to an instance running in the same availability zone. 1. Start typing the identifier of the volume to attach into the Volume text box (the volume is already in the text box if you navigated to this dialog from the Manage Volumes screen). A list of matching volumes will appear; select the volume from the list. 2. Start typing the instance identifier into the Instance text box (this instance is pre-selected for you if you navigated to this dialog from the Manage Instances screen). A list of matching instances will appear; select the instance from the list. 3. To optionally specify a device name to use for the attached volume, type the device name into the Attach as device text box. 4. Click the Attach button. Detach Volumes This dialog box lets you verify that you wish to detach one or more volumes from running instance(s). 1. Verify that you want to detach the listed volume(s). 2. Click the Yes, detach button. Work with Instances This section covers how to work with the instance dialogs and screens in the Eucalyptus User Console. Manage Instances This screen allows you to view a list of your instances, create new instances, and connect to, reboot, stop, terminate, and delete instances. You can page through the list of instances by clicking the navigation buttons at the bottom of the screen. Sorting the Instances List Click on any column header to toggle sorting the list of instances in ascending or descending order by the selected column. Searching and Filtering the Instance List 1. Type some search text into the Search text box to filter the list of instances. 2. For some lists, you can select one or more filters by pressing the enter key or clicking on the search bar and selecting an available filter from the drop down list. Selecting some filters will expose a menu with a list of valid filter values that you can select by pressing the enter key or clicking. Viewing Details of an Instance You can expand an instance entry in the list to see details about the instance, including associated volumes and tags. 1. Click the name of the instance in the list of instances. The area beneath the instance name will expand to a tabbed interface. 2. Click the General tab to see a panel of detailed information about the instance, include the volume associated with the instance. 3. 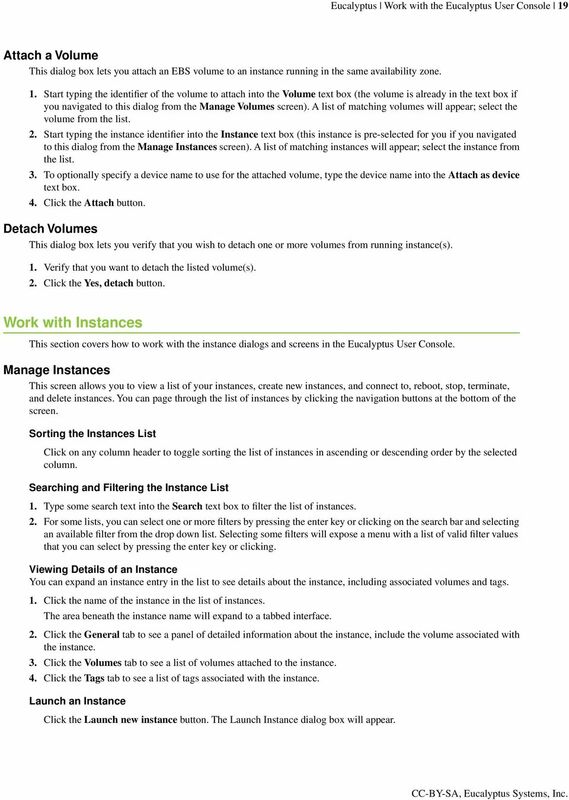 Click the Volumes tab to see a list of volumes attached to the instance. 4. Click the Tags tab to see a list of tags associated with the instance. Launch an Instance Click the Launch new instance button. The Launch Instance dialog box will appear. 20 Eucalyptus Work with the Eucalyptus User Console 20 Connect to an Instance Select the instance and then select Connect from the More actions menu at the top of the list. The Connect to instance dialog box will appear with further instructions. Reboot an Instance Select the instance and then select Reboot from the More actions menu at the top of the list. The Reboot instance dialog box will appear. Stop an Instance Select the instance and then select Stop from the More actions menu at the top of the list. The Stop instance dialog box will appear. 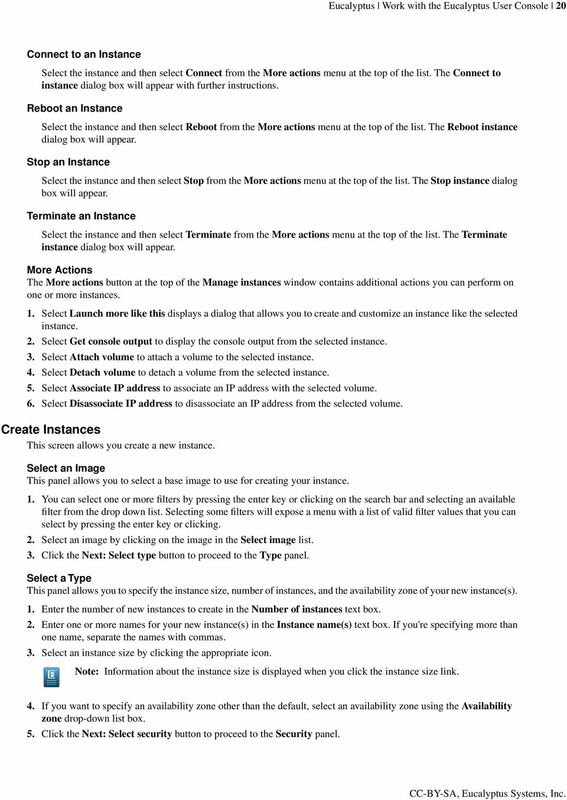 Terminate an Instance Select the instance and then select Terminate from the More actions menu at the top of the list. The Terminate instance dialog box will appear. More Actions The More actions button at the top of the Manage instances window contains additional actions you can perform on one or more instances. 1. Select Launch more like this displays a dialog that allows you to create and customize an instance like the selected instance. 2. Select Get console output to display the console output from the selected instance. 3. Select Attach volume to attach a volume to the selected instance. 4. Select Detach volume to detach a volume from the selected instance. 5. Select Associate IP address to associate an IP address with the selected volume. 6. Select Disassociate IP address to disassociate an IP address from the selected volume. Create Instances This screen allows you create a new instance. Select an Image This panel allows you to select a base image to use for creating your instance. 1. You can select one or more filters by pressing the enter key or clicking on the search bar and selecting an available filter from the drop down list. Selecting some filters will expose a menu with a list of valid filter values that you can select by pressing the enter key or clicking. 2. Select an image by clicking on the image in the Select image list. 3. Click the Next: Select type button to proceed to the Type panel. Select a Type This panel allows you to specify the instance size, number of instances, and the availability zone of your new instance(s). 1. Enter the number of new instances to create in the Number of instances text box. 2. Enter one or more names for your new instance(s) in the Instance name(s) text box. If you're specifying more than one name, separate the names with commas. 3. Select an instance size by clicking the appropriate icon. Note: Information about the instance size is displayed when you click the instance size link. 4. If you want to specify an availability zone other than the default, select an availability zone using the Availability zone drop-down list box. 5. Click the Next: Select security button to proceed to the Security panel. 21 Eucalyptus Work with the Eucalyptus User Console You can optionally create tags for your instance. To help you manage your cloud's instances, images, and other Eucalyptus resources, you can optionally assign your own metadata to each resource in the form of tags. You can use tags to create user-friendly names, make resource searching easier, and improve coordination between multiple users. To add tags to your new instance(s): a) Type the key name for your tag into the Key text box. b) Type the value for your tag into the Value text box. c) If you wish to add additional tags, click the + button to the right of the Value text box. d) If you want to edit a tag you've already entered, click the pencil icon to the right of the Value text box. e) If you wish to delete a tag that you've already entered, click the - button to the right of the Value text box. 7. Click the Next: Select security button to proceed to the Security panel. Specify Security This panel allows you to specify the key pair and security group that will be used by your new instance(s). NOTE: if you create a key pair or security group in this section, they will automatically be selected for use in your new instance. 1. Select a key pair using the Key pair drop-down list box. Note: You can also create a new key pair by clicking the Create new key pair link to display the Create new key pair dialog box. 2. Select a security group using the Security group drop-down list box. Note: You can also create a new security group by clicking the Create new security group link to display the Create new security group dialog box. Note: If you select the default security group, make sure that you've added rules to the default security group so that you can access your instances. 3. You can optionally specify advanced options by clicking the Select advanced options link. 4. Click the Launch instance(s) button. Specify Advanced Options This panel allows you to specify advanced options for your new instance(s). You can add user data, override the kernel and RAM disk IDs, specify private networking, and add additional storage. 1. Specify custom user data by typing it into the User data text box or by attaching a file by clicking the Choose file button. 2. You can override the kernel ID in the selected image with the Kernel ID drop-down list box. 3. You can override the RAM disk ID in the selected image with the RAM disk ID drop-down list box. 4. Click the Monitoring check box to specify that detailed CloudWatch metric gathering should be enabled for your new instance(s). 5. Click the Network check box to specify that your new instance should use private addressing only. Private addresses cannot connect directly to the Internet and must go through a NAT (Network Address Translation) device or an elastic IP address mapped to the instance. 6. Click the Launch instance(s) button to launch your new instance(s). Stop Instance This dialog box allows you to confirm or cancel a stop instance operation. Verify Stop Instance 1. To verify that you wish to stop the selected instance(s), click the Yes, stop button. 2. To cancel the delete operation, click the Cancel button. 22 Eucalyptus Work with the Eucalyptus User Console 22 Reboot Instance This dialog box allows you to confirm or cancel a reboot instance operation. Verify Reboot Instance 1. To verify that you wish to reboot the selected instance(s), click the Yes, reboot button. 2. To cancel the delete operation, click the Cancel button. Get Console Output This dialog box displays the console output of the selected instance. Click the Close button to dismiss the console output dialog box. Launch More Instances Like This This dialog box allows you create one or more new instances that have the same characteristics as an instance you've already created. Specify the Number of Instances This panel allows you to specify the number of new instances to launch. 1. Enter the number of instances you'd like to launch into the Instances text box. 2. You can optionally specify advanced options by clicking the Select advanced options link. 3. Click the Launch Instance(s) button to launch your new instances. Add Tags To help you manage your cloud's instances, images, and other Eucalyptus resources, you can optionally assign your own metadata to each resource in the form of tags. You can use tags to create user-friendly names, make resource searching easier, and improve coordination between multiple users. This panel allows you to specify tags for your new instance(s). 1. Note: If you don't want to add tags to your new instances, you can skip this section. Type the key name for your tag into the Key text box. 2. Type the value for your tag into the Value text box. 3. If you wish to add additional tags, click the + button to the right of the Value text box. 4. When you are finished adding tags, you can click the Next: Select security button to proceed to the Advanced Options panel, or click the Launch instance(s) button to launch your new instance. Specify Advanced Options This panel allows you to specify advanced options for your new instance(s). You can add user data, override the kernal and RAM disk IDs, specify private networking, and add additional storage. 1. Specify custom user data by typing it into the User data text box or by attaching a file using the Attach file link. 2. You can override the kernel ID in the selected image with the Kernel ID drop-down list box. 3. You can override the RAM disk ID in the selected image with the RAM disk ID drop-down list box. 4. Click the Network check box to specify that your new instance should use private addressing only. Private addresses cannot connect directly to the Internet and must go through a NAT (Network Address Translation) device or an elastic IP address mapped to the instance. 5. For EBS-backed instances, you can configure the root volume of your instance: a) Type the size of the attached storage in gigabytes into the Size (GB) text box. b) Select the Delete on termination check box if you would like the attached storage to be deleted when the instance is terminated. 6. Click the Launch instance(s) button to launch your new instance(s). 23 Eucalyptus Work with the Eucalyptus User Console 23 Terminate Instance This dialog box allows you to confirm or cancel a terminate instance operation. Verify Instance Termination 1. To verify that you wish to terminate the selected instance(s), click the Yes, terminate button. 2. To cancel the delete operation, click the Cancel button. Work with Auto Scaling Groups This section covers how to work with the auto scaling groups in the Eucalyptus User Console. Manage Scaling Groups This screen allows you to view a list of your scaling groups, create new scaling groups, and edit existing scaling groups. You can page through the list of scaling groups by clicking the navigation buttons at the bottom of the screen. Sorting the Scaling Groups List Click on any column header to toggle sorting the list of scaling groups in ascending or descending order by the selected column. Searching and Filtering the Scaling Groups List 1. Type some search text into the Search text box to filter the list of scaling groups. 2. For some lists, you can select one or more filters by pressing the enter key or clicking on the search bar and selecting an available filter from the drop down list. Selecting some filters will expose a menu with a list of valid filter values that you can select by pressing the enter key or clicking the value. Viewing Details of a Scaling Group You can expand a scaling group entry in the list to see details about the scaling group, including associated instances, launch configurations, scaling policies, and tags. 1. Click the name of the scaling group in the list of scaling groups. The area beneath the scaling group name will expand to a tabbed interface. 2. Click the General tab to see a panel of detailed information about the selected scaling group. 3. Click the Instances tab to see the list of instances for the auto scaling group, as well as the instance's health status and state. 4. Click the Policies tab to see a list of scaling policies associated with the scaling group. 5. Click the Tags tab to see a list of all tags associated with the scaling group. Create a New Scaling Group Click the Create New Scaling Group button. The Create New Scaling Group dialog box will appear. Quick Scale This action allows you to quickly change the desired number of instances in your scaling group. Select the scaling group from the list of scaling groups, and then select Quick scale from the More Actions drop-down menu. The Quick Scale dialog will appear. Edit Scaling Group This action allows you to change the properties of a scaling group. Select the scaling group from the list of scaling groups, and then select Edit Properties from the More Actions drop-down menu. The Edit Scaling Group dialog will appear. 24 Eucalyptus Work with the Eucalyptus User Console 24 Delete This action allows you to delete one or more scaling groups. Select one or more scaling groups from the list of scaling groups, and then select Delete from the More Actions drop-down menu. The Delete scaling group dialog will appear. Manage instances This action allows you to set the health status on the instances in your scaling group. Select the scaling group from the list of scaling groups, and then select Manage instances from the More Actions drop-down menu. The Manage instances dialog will appear. Create a Scaling Group This dialog allows you to create a scaling group. An Auto Scaling group defines the parameters for the Eucalyptus instances that are used for scaling, as well as the minimum, maximum, and (optionally) the desired number of instances to use for Auto Scaling your application. 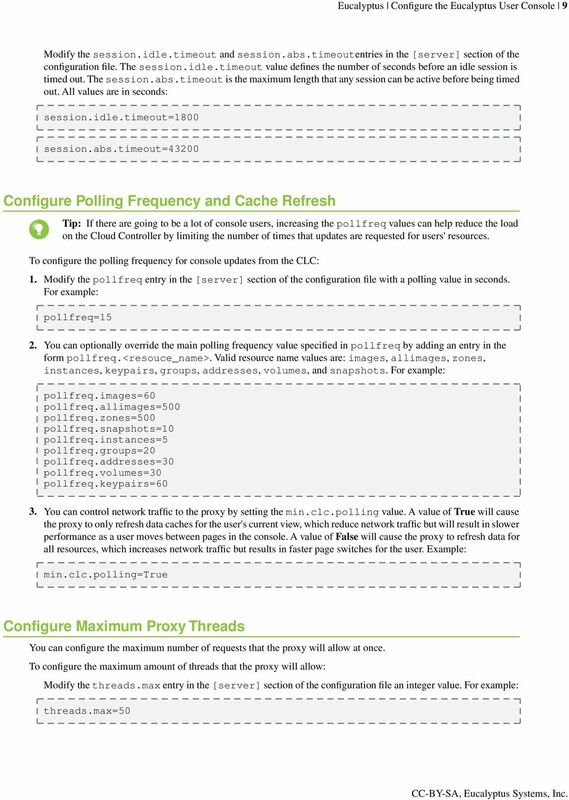 For more information on Auto Scaling, please see Using Auto Scaling in the Eucalyptus User Guide. General This section is where you specify the basic configuration of your new auto scaling group. 1. Type the name of your new auto scaling group in the Name textbox. 2. 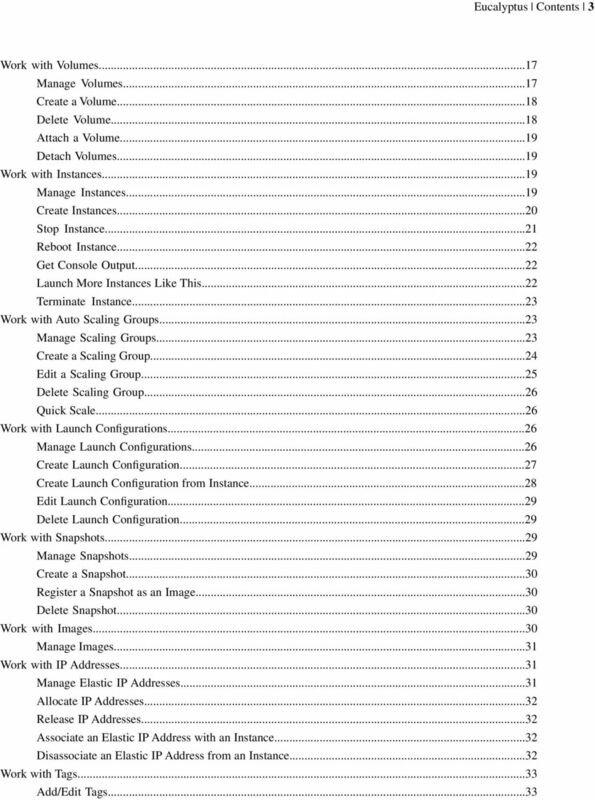 Select a launch configuration from the Launch Configuration drop-down list box. A launch configuration defines the properties of the instances that are launched as part of your auto scaling group. 3. Select the maximum number of instances you want running in your autoscaling group using the Maximum control. 4. Specify the minimum number of instances you want running using the Minimum control. 5. Specify the desired number of instance you want running using the Desired control. Tags A tag is a key/value pair containing data that you can attach to resources in your cloud. This section of the Create Scaling Group wizard allows you to define tags for for your scaling group and for instances that run in your scaling group. 1. If you want to apply the new tag to instances running in the scaling group, select the Propagate check box. 2. Type the key name for your tag into the Key text box. 3. Type the value for your tag into the Value text box. 4. If you wish to add additional tags, click the + button to the right of the Value text box. 5. If you want to edit a tag you've already entered, click the pencil icon to the right of the Value text box. 6. If you wish to delete a tag that you've already entered, click the - button to the right of the Value text box. 7. When you are finished adding tags, click the Next: Select membership button. Membership In this section, you can specify load balancers, availability zones, and health checks for the instances that run in your auto scaling group. 1. Select the type of health check for your auto scaling group from the Type drop-down list box. The auto scaling health check uses EC2 instance status checks to determine the health state of each instance in your auto scaling group. If your auto scaling group is using a load balancer, auto scaling will use both EC2 instance status checks and load balancing instance health checks. 2. Type the amount of grace period, in seconds, into the Grace period text box. This is the amount of time after a new instance is launched in your auto scaling group before health checks start for the instance. 3. Select the availability zone for your new scaling group from the Availability zones drop-down list box. You can add another availability zone to the new auto scaling group by clicking the + button next to the drop-down list box. 4. Select one or more load balancers for this auto scaling group from the Load balancers drop-down list box. Wavecrest InstallationGuide Wavecrest Certificate www.wavecrest.net Copyright Copyright 1996-2015, Wavecrest Computing, Inc. All rights reserved. Use of this product and this manual is subject to license. 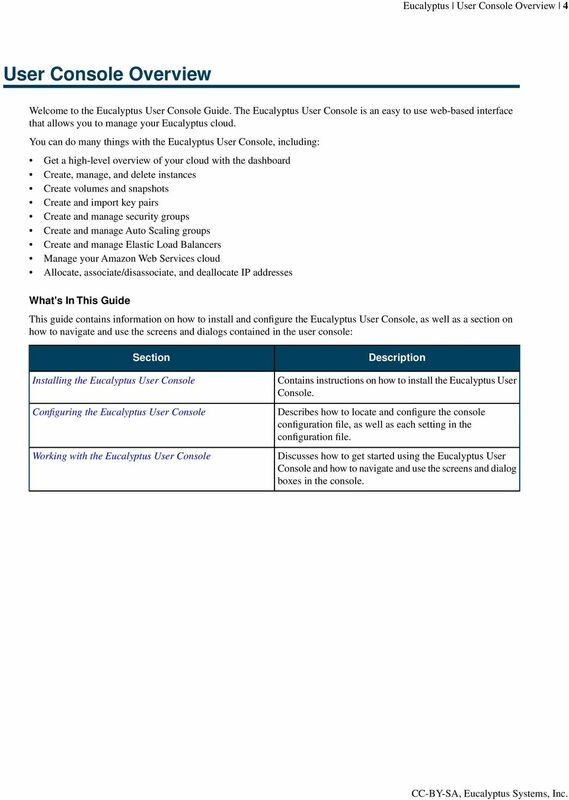 User Guide Cloud Gateway Software Device This document is designed to provide information about the first time configuration and administrator use of the Cloud Gateway (web filtering device software). The SSL device also supports the 64-bit Internet Explorer with new ActiveX loaders for Assessment, Abolishment, and the Access Client.